Twin limitations – space for an orchard and time to maintain it – keep home fruit production out of reach for many gardeners. Fortunately, our native flora includes edibles that thrive in our soil and climate, yielding fruit for a modest amount of effort. 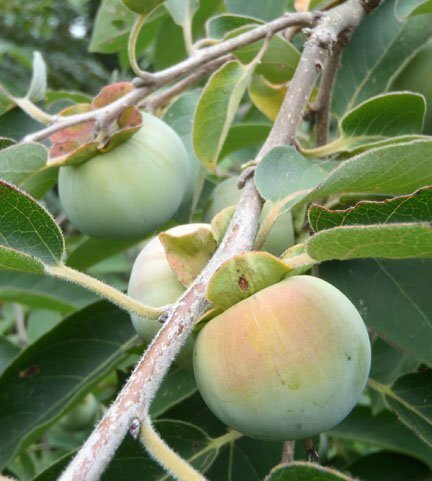 Three of the easiest to grow native fruits, muscadine grapes, persimmons and pawpaws, ripen in late summer and fall. With planning and careful positioning, each of them can serve double duty as food producers and striking landscape features. The muscadine grape (Vitis rotundifolia) was literally the first fruit introduced to Europe from what is now the Southeastern United States. Sir Walter Raleigh brought cuttings of a bronze muscadine to England from Roanoke Island in 1584. Growing in Manteo, ‘The Mother Vine,’ a bronze muscadine, is believed to be more than 400 years old. Obviously long-lived, muscadines are extremely disease resistant and are drought tolerant once established. In recent years, muscadines have become famous for their nutritional benefit and high concentration of antioxidants. Muscadines require a firm pruning each winter to control growth and improve fruit production. Their vigor and rapid growth make them an excellent choice for creating outdoor rooms and summer shade. Muscadine grapes are extremely sweet with a distinctive flavor, so it is wise to sample them before planting one in your backyard. One of our most widespread native trees, occurring from the coast to the mountains, is the American persimmon (Diospyros virginiana). The persimmon’s mature size of 50 feet, adaptability and drought tolerance make it useful in the landscape, particularly as a focal point in full sun. The large, dark green summer leaves turn shades of yellow to reddish-purple in fall, and the fruits are highly ornamental as they age to orange in late summer. As with any plant that produces fruit, persimmon trees should not be placed near entrances or over walkways, but enjoyed at some distance. Persimmons are among those plants that need both a male and female for fruit production (dioecious), but nurseries offer varieties such as ‘Meador’ that will fruit without a male pollinator. Persimmons are often used for baking, but can be eaten raw. Tasting an unripe persimmon is a mouth-wrenching experience. To be safe, never eat a persimmon unless it is soft to the touch. Ripe fruits will fall to the ground when their branches are given a gentle shake. Although less common in the wild than persimmon, our native pawpaw (Asimina triloba) is also very adaptable. An understory tree rarely exceeding 20 feet tall, the pawpaw can fit in smaller landscapes and will grow in sun or shade. Its exotic brown flowers occur on bare wood in spring. Zebra Swallowtail butterflies, for which pawpaw is the exclusive host plant, add summer color. The pawpaw’s large dramatic leaves easily create a tropical feel. Pawpaw fruit, reminiscent of mango and banana, makes it no surprise that the tree belongs to an otherwise tropical plant family. Pawpaws have the added benefit that the aromatic foliage is unappetizing to deer. Although not dioecious, at least two pawpaws are needed for good fruit production. Fortunately the pawpaw fruit’s delectability has led to the introduction of various cultivars. Choosing a named variety decreases the long wait, three years, before a pawpaw bears fruit. More delicate than persimmons, pawpaws are picked while still green in color. Like peaches, they give to gentle pressure when ripe. Persimmon and pawpaw trees benefit from an annual layer of mulch and regular water until established. Both may require the removal of suckers, especially in early years, to maintain a single form.